Remember that time the Wall Street Journal wrote an article about an influx of “start-up” companies raising seed/angel rounds and then all those companies subsequently trying to raise Series A rounds and failing hard? And then all these VCs and angels got in a fight about it, on Twitter, and on their own blogs? Well, we pulled some rough funding data from CrunchBase (which come to think of it should be a National Treasure), and, as it turns out, more and more companies are raising seed and angel rounds (we’re counting both as the same) and less and less companies are raising Series A. 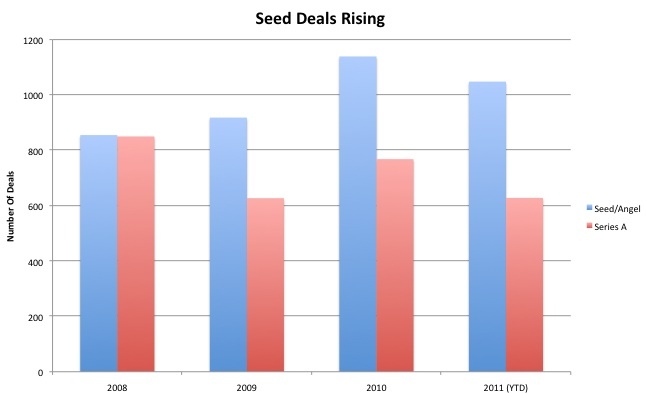 In fact the number of seed deals went up 33% from 2008 to 2010, while Series A deals were down 9.6% during the same period. In fact, we’re on track to have almost two times as many seed deals this year as Series A, while the two were neck and neck in 2008. It’s also worth noting the number of companies raising angel and seed rounds has gone up, but the dollar amount invested has either lessened or stayed the same. Last year, the cash invested in seed and angel rounds was $483 million, down 30 percent from 2009. Whereas the cash invested in Series As was $4.1 billion, up 17 percent—which means that seed investments are getting smaller and Series A investments are getting larger. But does this mean we’re in a “crunch”? Lightbank VC Paul Lee argues that the money is still there for Series A rounds – which would explain the investment amounts getting larger — just that the number of companies WHO NEED to raise Series A rounds has gone down, because they’re already profitable or have already been acquired — i.e. a good percentage of those startups in the seed/angel explosion we’re seeing don’t need to raise any further money. But that doesn’t make complete sense, don’t people want to invest in successful startups? Are we supposed to look somewhere for an impending flood of successful startups that are “Series A” boot-strapped (we don’t track those in Crunchbase)?